The Austin Chamber of Commerce is a private, non-profit, membership-driven organization comprised of 2,800+ business enterprises, civic organizations, educational institutions and individuals. Its mission is to provide leadership that facilitates the creation of a prosperous regional economy and effective advocacy for its members. Investing in the Austin community through Chamber membership supports a program of work that includes economic development, education and talent development, public policy, transportation and infrastructure, technology, as well as business attraction, retention, and expansion. 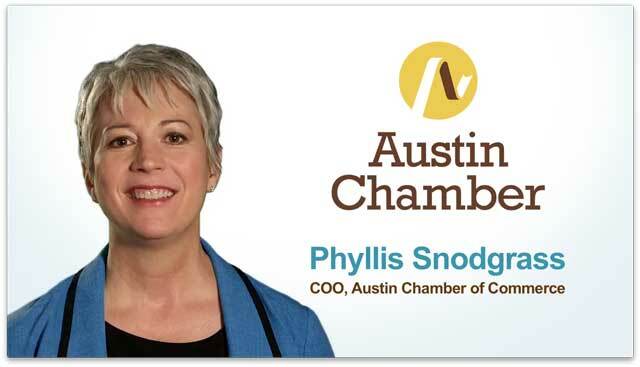 The Austin Chamber builds its program of work around the three core principles an investment in membership brings: business connection, community impact and economic prosperity.